With luscious blonde hair, clear blue eyes and legs forever, Texan model Jerry Hall, 54, is a true beauty icon. 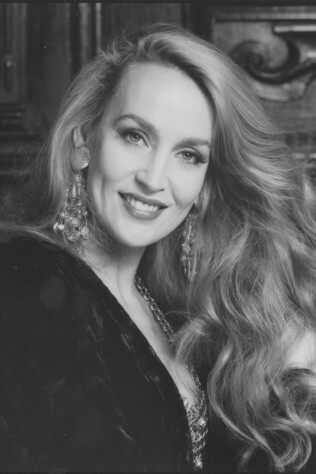 Jerry Hall moved to Paris as a teenager and appeared on over 40 magazine covers by age 21. A worldwide Vogue favourite, she shot with Norman Parkinson for British Vogue and Patrick Demarchelier for Paris Vogue, a feat that would make any model green with envy. She may be best known however as one of Helmut Newton’s favourites and as Mrs Mick Jagger. Her friendship with Andy Warhol, apartment sharing with Grace Jones and romances with rock stars Bryan Ferry and The Rolling Stones frontman are the stuff of legends. A campaign expert (Hall was the face of Yves Saint Laurent’s Opium, Revlon and Versace, to name a few), she made a comeback in 2009 and was shot by Karl Lagerfeld for Chanel. Great genes, dazzling hair, minimal makeup and lots of sunscreen (she’s currently the face of Invisible Zinc with her daughter, Vogue Australia covergirl Georgia May), are the secrets of this beauty icon’s success. We talk to Rosie Hardy of Sydney’s Colour Lounge for top tips for gorgeous Jerry locks. via Jerry Hall hair how-to.